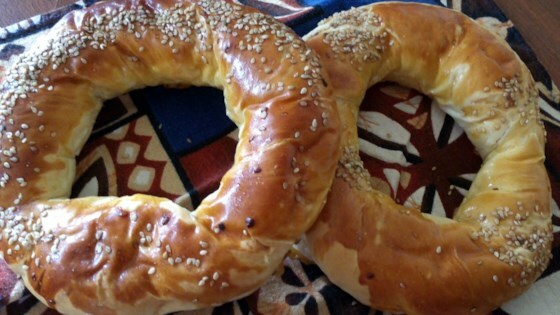 "These small bread rings coated with sesame seeds, called simit, are a popular Turkish snack or street food." Toast sesame seeds in a dry frying pan over low heat until golden and fragrant, about 5 minutes. Keep a close eye as they change color very quickly. Combine flour, yeast, and salt in a large bowl. Make a well in the flour mixture and add water, milk, melted butter, and olive oil; stir well until dough pulls together. Turn dough out onto a lightly floured surface and knead until smooth and elastic, about 8 minutes. Place dough in a large, lightly-oiled bowl and turn to coat. Cover with a towel and let rise in a warm place until doubled in volume, 30 minutes to 1 hour. Divide dough in to 8 parts and roll each part into a 6- to 8-inch long rope. Join ends together and seal to form a ring. Place rings on prepared baking sheet, cover with a clean kitchen towel and let rise for 15 minutes. Preheat oven to 350 degrees F (175 degrees C). Brush rings with beaten egg and sprinkle generously with toasted sesame seeds. Bake in the preheated oven until golden and crusty, about 20 minutes. Use nigella or poppy seeds instead of sesame seeds, if desired. Place olive oil, melted butter, water, milk, and egg in the pan of the bread machine. Add flour, salt, and yeast and select the setting for Basic or White Bread. The dough should come out smooth and elastic.